Islamabad, 3rd January, 2012, Islamabad Hotel: Education is seen as a necessity and a fundamental non-negotiable right for every child. As embedded in the constitution of Pakistan, Article 25 A makes provision for free and compulsory education for all children aged 5-16 years primarily the responsibility of the state. Consequently, quality education for all is critical anchored firmly around the teacher. Variations in teacher effectiveness are important determinants of differences in school quality education has long been emphasized by the stakeholders, unfortunately very little has been done for actual implementation of education as a “right”. Teacher education and training on the one hand is a focus of every education program/project in the country and yet remains an area where the evidence based complex dimensions remain under explored. A seminar was conducted by Idara-e-Taleem o Aagahi /Institute for Professional Learning on 3rd January, 2013 in Islamabad Hotel, focusing on Teacher Quality in Pakistan: urgency for reform as part of the Right to Education series that draws upon the Annual Status of Education Report (ASER) core areas of enquiry. Dr. Monazza, the main speaker from Oxford University, the Institute of Education (IoE), University of London and the Senior ASER Research Associate presented research findings from the South Asian region (SAR) and Pakistan. She highlighted three aspects, equity, efficiency and effectiveness, which needed to be addressed for achieving improved learning outcomes. She urged the audience to look for solutions beyond teacher qualifications to processes transacted in the classrooms, accountability and incentive structures and continuous professional development opportunities. The growing difference between salaries of public and private sector teachers of approximate 6:1 in favour of the former is a point to ponder when it is not matched by commensurate student learning outcomes. The challenge of economic and social distance between the teachers and the students is another caveat which needs rigorous research across Pakistan. She urged the need to motivate qualified and quality workforce to join the teaching profession, for performance based career growth options. The dialogue was attended by 50 representatives of the Academia/researchers, civil society, INGOs, development partners, Ministry of Education and Training and other experts, to devise an action plan on how the knowledge from the teacher can be effectively transferred to the students. Baela Raza Jamil, Trustee/Advisor ITA urged the participants to familiarise themselves with the emergent legislation on RTE providing inputs on the rules of business related to teachers qualification, preparation and conditions of performance. She urged organizations to widen the scope of research and evidence on teachers. 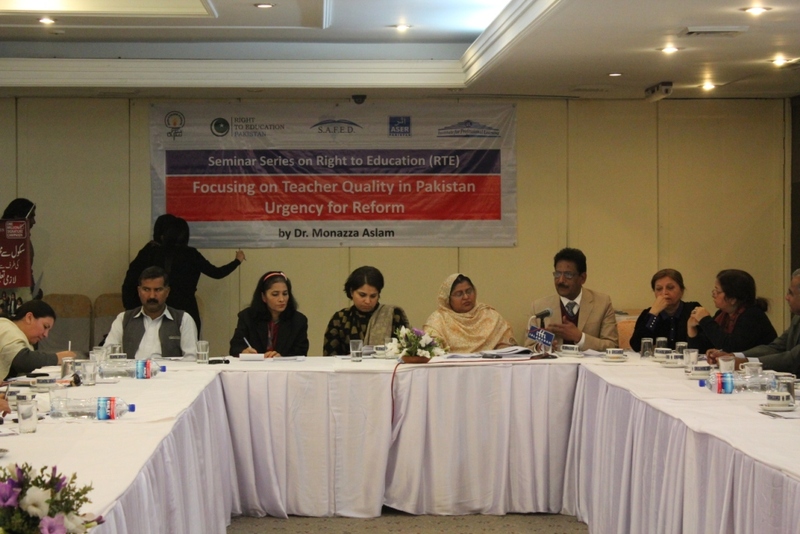 Commenting on the issues related to teacher quality, Nargis Sultana, Senior manager at the Foundation of Open Society Institute (FOSI), highlighted that with a workforce of more than 1.4 million teachers,there is a lack of accountability and inability of the system to attract and retain the human resources. She highlighted that unfortunately teaching is the last choice for everyone and it is critical that we explore ways of making this job attractive! Huma Mirza, the Senior Education Advisor- Canadian International Development Agency (CIDA), said that “teacher is the pilot in the aircraft”, we cannot survive without them. She highlighted the fact that the private sector is increasingly having a larger share in the sector, approximately more than 50% and there is no condition for recruiting trained teachers. This was a point which needed a lot of thought. Mr. Jamil Bajwa the third discussant commented on the short cuts often taken in training needs assessment of teachers and poor monitoring and support systems. He said that teachers are still using traditional methods which reduces the quality of students learning outcome. The discussion was enriched by the participants. Nadeen working for an innovative pilot school with non-traditional approaches in teacher recruitment, preparation and pedagogy shared experiences about hiring teachers who are crafting a unique learning experience where qualification is in fact a disqualification! Ms. Rana Hussain from Pre STEP raised challenges of governance in government schools and the possibilities of the four year B.Ed program in preparing teachers of tomorrow. Asif Khan from NCHD, Nadeem Ahmed from SPARC and representatives from Save the Children shared disconnects between home language and medium of instruction; of teachers hired in KPK without knowledge of Pashto to teach in schools where the medium of instruction is Pashto! The Science Foundation representatives shared their work on enquiry based learning approaches. Huma Mirza identified the urgency for a paradigm shift and a change in attitude of teachers. Nargis Sultana reinforced the urgent need to list key actions for politicians as they prepare for elections so that these can be tracked. The RTE dialogue series hopes to raise issues related to teachers quality, through evidence based research across Pakistan. An informed public debate is overdue to address this burning issue virtually through social media and local conversations for a vibrant and shared journey towards teacher reforms and actions. All materials may be used for such dialogues at different levels.